This Question Should be Easy! Most years, Palms holds a Black History Assembly (theme: "I Have a Dream") where students perform -- singing, dancing, doing skits, etc. -- in recognition of African-American culture. The Palms Jazz Band often performs. Other forms of recognition occur throughout the month. Can you identify these famous black Americans? Answers are below but don't click until you try to answer the questions yourself. ...invented a machine called a "lasting machine" that stitched the leather of a shoe to its sole. ...served three years in reform school for attempted burglary before writing many famous rock-and-roll songs. ...sang in church choirs while growing up as the granddaughter of two Methodist ministers. ...worked at a childcare center before becoming a well-known political figure. ...was a one-time Nation of Islam minister and was assassinated while giving a speech in 1965. ...had first and middle names "Edward Kennedy" at birth. ...was the first black congresswoman to be elected from the Deep South. ...was a Harvard graduate and played a role in starting the National Association for the Advancement of Colored People (NAACP). ...helped register black voters in Mississippi and led boycotts there of firms that practiced racial discrimination. ...was awarded the Nobel Peace Prize for his role in making an Arab-Israeli peace in 1949. We celebrate Martin Luther King Jr. Day (MLK Day for short) on the third Monday of January. The MLK Day of Service is a chance to help your neighbors and community on MLK Day. On this day, everyone is encouraged to serve, educate, volunteer, and share. Participating in the MLK Day of Service is a great way to answer! For ideas, download the 2015 MLK Day of Service flyer. 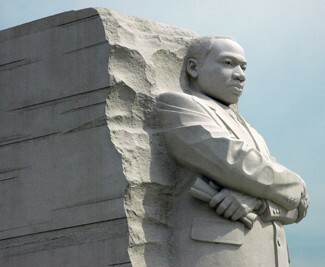 Do you know where this Martlin Luther King Jr. Memorial is? Have you been to see it? Would you like to? The answer to the first question is upside-down below.